When he finally seized the sword, Morghan felt the power again, spiking in a sensation like the emptiness of unspoken words. Raw emotion filtered through him just as the voice had filtered through him before, and in that instant, in a heartbeat, in the rawness of memory where it clawed at him from the dark dreams that the day tried to push away, he knew that anything was possible. Too many things still to be done. So many debts to repay. A Prayer for Dead Kings and Other Tales includes six short stories, the novella Ghostsong, and the novel A Prayer for Dead Kings. Trade paperback available to order at most other bookstores (ISBN: 978-1927348178). If you have trouble obtaining a copy of any Insane Angel Studios e-book, or if you can't order a copy of a trade paperback title through your bookstore of choice, drop a line to insaneangel@insaneangel.com. 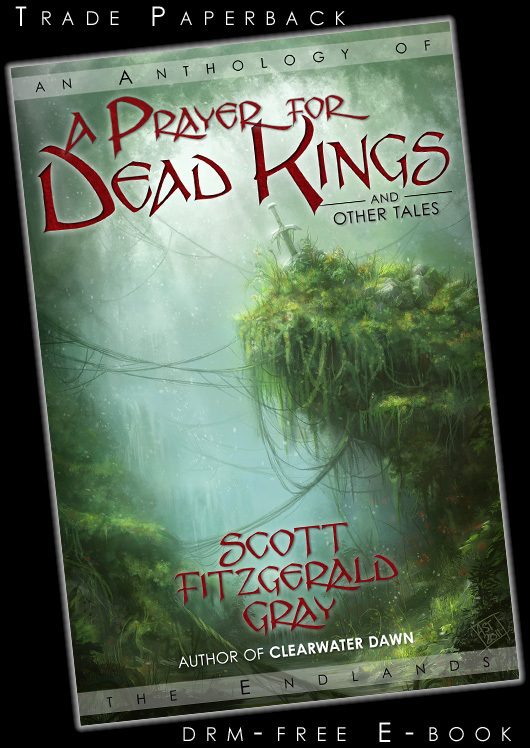 The first Endlands anthology from Scott Fitzgerald Gray, A Prayer for Dead Kings and Other Tales follows a disparate group of heroes and villains caught up with the dark history — and darker destiny — of ancient magic lost to time and memory. In the aftermath of the fall of Empire, magic is the ultimate force for tyranny and freedom in the lands of the Elder Kingdoms. Magic defines the line between right and wrong, life and death that compels countless characters to take up a mantle of heroism they never expected to wear.